Wrap up warm before you head out into the cold night, with toffee apples at the ready and eager children looking out for Guy Fawkes. Without doubt, the safest place to enjoy fireworks is at a professionally organised event. That said, if you, like thousands of others are intent on lighting a few fireworks at home, then there are some safety precautions you can take to keep your family and home as safe as possible. Check you are legally allowed to use fireworks in your area. 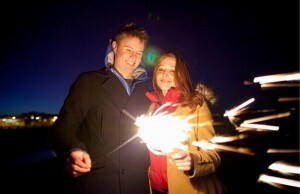 You can light fireworks up to midnight on the 5th November (unlike the usual legal limit of 11pm). Only buy fireworks that comply with the latest safety guidelines. Unlabelled or ‘home-made’ varieties are both illegal and dangerous. Purchase fireworks from a known retailer and look for fireworks marked with the British Standard number (BS 7114). Check that they’re suitable for home use and not too big for the size of your garden. Always store fireworks in a metal box both before and during a display. Find a cool, dry area out of reach of children and animals. Do not store fireworks under the stairs or in an alleyway. Keep a bucket of water and a garden hose close by for emergencies. Fireworks and alcohol don’t mix. When conducting a fireworks display, avoid consuming alcohol. Never let your child play with or ignite fireworks. They’re explosives not toys and can cause fatal injuries. Treat sparklers with caution. They may look pretty when lit, but they can heat up to 2000 °C – hot enough to melt glass. Don’t give sparklers to children under the age of 5. Supervise your child when holding sparklers. Keep away from the face, hair, clothing and other people. Have a bucket of water available to plunge the sparkler into when finished, as the heated rods can be lethal to little fingers. For a safer alternative, try using glow sticks. They come in a variety of colours and can be just as much fun with none of the risk. Do not wear flammable or loose clothing around fireworks. Keep your children at a safe distance as sparks can travel. Fireworks must only be used in a controlled environment. Place fireworks away from your home and clear the area of flammable material, such as dry grass and leaves. Ensure guests are standing at a safe distance away and that the fireworks are pointing away from both spectators and property before lighting them. Throwing fireworks is illegal and carries a maximum penalty of £5,000 if prosecuted. It’s also highly dangerous. Never carry fireworks around in your pocket – the friction could set them off. Always wear eye protection and thick gloves before igniting fireworks. Light one firework at a time and keep them at arms length by using a taper. Stand back quickly. If it fails to ignite, don’t attempt to relight it. Wait until the end of the display before putting the faulty firework into a bucket of water to neutralise. Protect your child’s hearing as sounds above 85 decibels can cause hearing loss. Some fireworks exceed this level with ease. Make sure you and your family are wearing ear-defenders or earplugs to protect your hearing, especially in a small environment such as a back garden. Don’t let children clear up spent fireworks at the end of the event. If lit, they may still explode. Always drench the used fireworks using a hose or a bucket of water before binning them. Never throw a firework onto a bonfire. In the event that someone catches fire, remember to STOP, DROP and ROLL to put the flames out. Don’t run. If injured, go straight to hospital or seek immediate medical advice. If it’s a burn, remove any clothing from the area and bath in cool running water. Keep the wound clean – don’t let your child touch or rub the area as it may cause infection and further inflammation. This is particularly important if it’s an eye injury. Keep family pets indoors to avoid unnecessary distress or injury. Close windows and curtains to try and reduce the noise and create a calm environment. Animals can often find fireworks frightening. We offer an alternative to conventional insurance for the serving, military families & supporters of the military. If you need Home Cover this autumn, why not get a quote from us?